The specific remote dog beeper collar for hunting, REM-433 model, has a waterproof design (IP67). It is provided with 3 settings (modes) for the repeated interval of Run Sound (10,20, 30 sec) and 4 sounds. In addition, Point Only function is provided as well. The sounds are Standard Beep, Hawk Scream, Bobwhite Call, Trill Tone. The REM-433 has a very loud and clear sound, which can be heard in a distance up to 450 meters. 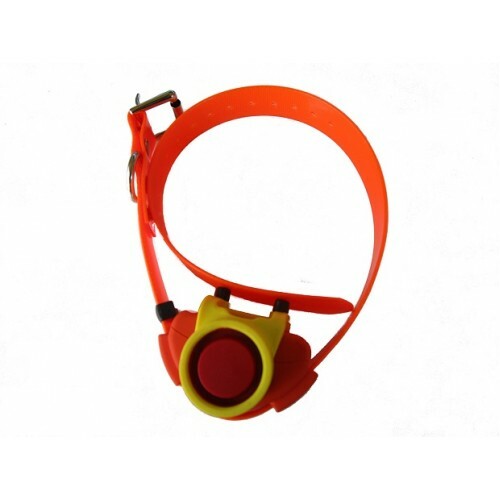 The REM-433 dog beeper collar is powered by a built-in rechargeable Li-Ion battery. It has a magnetic built-in ON/OFF switch, which is activated by the magnet provided. REM-433 has a 3-axis oritentation/motion sensor. The user can set different sounds for run and point function. The remote of the beeper can control up to 3 beepers. It is powered by a built-in rechargeable Li-Ion battery. Remote's range is 1500 meters. The user can change the sounds from the remote. The remote is interactive. The user can swith off the beeper sound, by pressing a button on the remote. Moreover there is on the remote a led and sound indication when the dog points only. A silicon belt is provided and a charger. The device's length is 6.5 cm. The device has 1 year warranty, and we offer quick service after the warranty.